Central High School recently held College Application and Exploration Week to promote, encourage, and incorporate higher education in to the curriculum of their students by hosting several colleges and institutions who provided students with information for the Tennessee Promise or assisted with college applications. 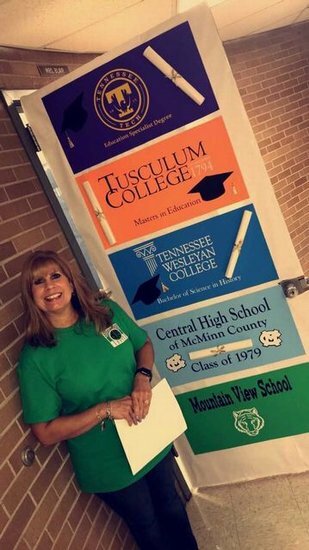 The faculty and staff also initiated interest by displaying their post-secondary education/training on their doors or work area. Several local merchants donated prizes toward our efforts as well. Pictured is Social Studies teacher, Teri Blair. Click here to view the photo album / slide show of all the doors!